Your generous donation can either be in the form of a one-time donation or set up as a recurring gift. If you do not have a preference for the area you want to support, you are encouraged to opt for ophthalmic research and training, it will help our general development based on priorities set by the Department. 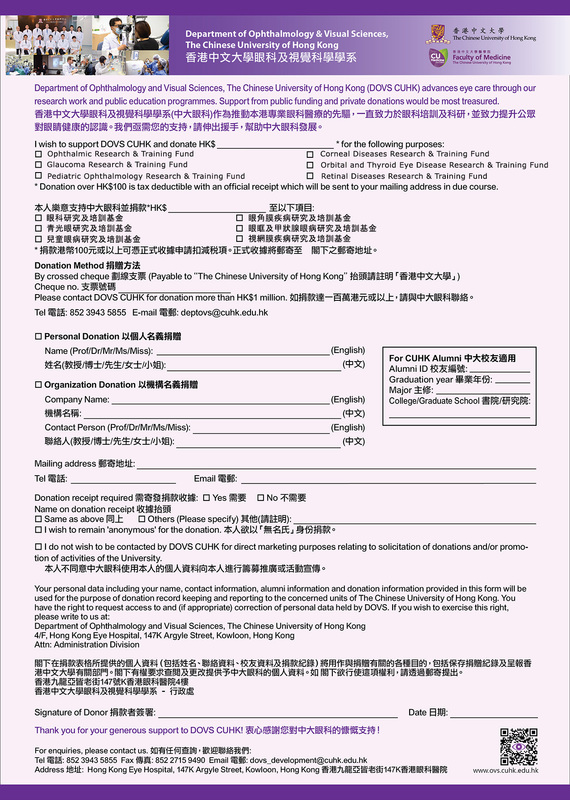 To make a gift, you could now choose to donate online or send us the completed donation form and the crossed cheque made payable to “The Chinese University of Hong Kong” at 4/F, CUHK DOVS, Hong Kong Eye Hospital, 147K Argyle Street, Kowloon, Hong Kong, together with your name, contact number & cheque number. If you have any questions, please do not hesitate to contact us at 3943 5868. Thank you for your support — all of the staff members at CUHK DOVS and the countless patients with eye diseases who benefit from your generosity will be most grateful ! Do you need a donation receipt ? The Department would like to contact donors for direct marketing purposes relating to solicitation of donations and/or promotion of activities of the University. For more details on our personal data policy, please visit our website at www.cuhk.edu.hk/oia/pdpao.